Thank you for your interest in Plato Academy K-8 Charter Schools. Plato Academy Charter Schools are public charter schools that do not charge tuition. Below you will find information about our application process. As demand for a Plato Academy education has increased, we have responded in order to accommodate as many families as possible by increasing our enrollment through the addition of new schools. Please complete an application for each and every location for which you have an interest. Students that submit completed applications during an open application period will be selected for enrollment either on a first come-first serve basis (when there are more seats than student applications received during the open application period), or through a lottery process (when there are more student applications than seats available during an open application period). If a lottery is conducted, students’ names will be randomly drawn (excluding those with an enrollment preference) and numbered sequentially as chosen and recorded in that order. Available seats are filled first and remaining students are placed on a waiting list in the order of their drawing. Students will be notified of their admission status shortly after the lottery date via e-mail and/or telephone. Plato Academy lottery drawings are open to the public and all lottery dates and locations will be posted on the website. During the lottery process a school official such as the School Principal or a designee such as the Enrollment Specialist, will draw and record the names in the presence of another school or management official. Please note that the placement of your student on Plato Academy’s wait list will not impact or interfere with your students’ enrollment at any other Pinellas County public or charter school, and it will be your option to accept or decline an invitation should a seat become available at Plato Academy. Enrollment is contingent on student interest, availability of qualified staff, and facilities. Plato Academy Clearwater: 1st-8th grade. Applications are being accepted and will be processed as noted above. Open enrollment for the Clearwater kindergarten 2013-2014 will be set for February 18, 2013 through February 22, 2013. Only applications submitted during the open enrollment will be valid. Any previously submitted applications will not be valid. Lottery will be held March 1, 2013, 1:30pm at the Superior Management offices located at 2560 Gulf to Bay Blvd, Clearwater, 33765. Need not be present, email nofitications will be sent to all applicants. Plato Academy Largo: 1st-8th grade. Applications are being accepted and will be processed noted above. Kindergarten open enrollment will be November 1, 2012 through November 5, 2012. Lottery will be held November 8, 2012, 2:30pm at the Superior Management offices located at 2560 Gulf to Bay Blvd, Clearwater, 33765. Need not be present, email nofitications will be sent to all applicants. Plato Academy Palm Harbor: 1st-8th grade. Applications are being accepted and will be processed noted above. Kindergarten open enrollment will be November 1, 2012 through November 5, 2012. Lottery will be held November 8, 2012, 2:30pm at the Superior Management offices located at 2560 Gulf to Bay Blvd, Clearwater, 33765. Need not be present, email nofitications will be sent to all applicants. Plato Academy Seminole: Kindergarten open enrollment will be November 1, 2012 through November 5, 2012. Applications for grades 1st - 7th are being accepted through May 31, 2013 and will be subject to a lottery process as described above. Lottery will be held late June, 2013 (date to be determine) at the Superior Management offices located at 2560 Gulf to Bay Blvd, Clearwater, 33765. Need not be present, email nofitications will be sent to all applicants. Plato Academy Tarpon Springs: Kindergarten open enrollment will be November 1, 2012 through November 5, 2012. Applications 1st-6th grade (will grow to include 7th and 8th grades in subsequent years)for are being accepted through May 31, 2013 and will be subject to a lottery process as described above. Lottery will be held late June, 2013 (date to be determine) at the Superior Management offices located at 2560 Gulf to Bay Blvd, Clearwater, 33765. Need not be present, email nofitications will be sent to all applicants. Plato Academy Clearwater: Open enrollment for kindergarten 2014-2015 will be set for March 4, 2013 through March 8, 2013. Next open enrollment for kindergarten 2014-2015 will be now through October 31, 2013. Lottery will be held November 6, 2013, 2:30pm at the Superior Management offices located at 2560 Gulf to Bay Blvd, Clearwater, 33765. Need not be present, email nofitications will be sent to all applicants. For gardes 1st-8th, applications are being accepted and will be processed as noted above. Plato Academy Largo: Open enrollment for kindergarten 2014-2015 will be set for March 4, 2013 through March 8, 2013. Next open enrollment for kindergarten 2014-2015 will be now through October 31, 2013. Lottery will be held November 6, 2013, 2:30pm at the Superior Management offices located at 2560 Gulf to Bay Blvd, Clearwater, 33765. Need not be present, all applicants will be notified via email as to the results. For gardes 1st-8th, applications are being accepted and will be processed as noted above. Plato Academy Palm Harbor: Open enrollment for kindergarten 2014-2015 will be set for March 4, 2013 through March 8, 2013. Next open enrollment for kindergarten 2014-2015 will be now through October 31, 2013. Lottery will be held November 6, 2013, 2:30pm at the Superior Management offices located at 2560 Gulf to Bay Blvd, Clearwater, 33765. Need not be present, all applicants will be notified via email as to the results. For gardes 1st-8th, applications are being accepted and will be processed as noted above. Plato Academy Seminole: Open enrollment for kindergarten 2014-2015 will be set for March 4, 2013 through March 8, 2013. Next open enrollment for kindergarten 2014-2015 will be now through October 31, 2013. Lottery will be held November 6, 2013, 2:30pm at the Superior Management offices located at 2560 Gulf to Bay Blvd, Clearwater, 33765. Need not be present, all applicants will be notified via email as to the results. For grades, 1st-8th, applications are being accepted through December 31, 2013 and will be subject to a lottery process as described above. 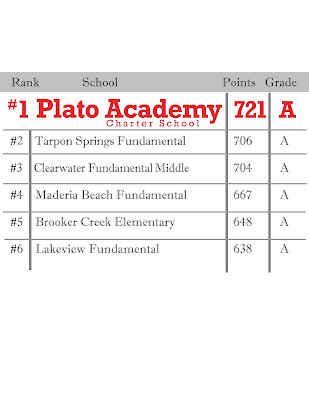 Plato Academy Tarpon Springs: . Open enrollment for kindergarten 2014-2015 will be set for March 4, 2013 through March 8, 2013. Next open enrollment for kindergarten 2014-2015 will be now through October 31, 2013. Lottery will be held November 6, 2013, 2:30pm at the Superior Management offices located at 2560 Gulf to Bay Blvd, Clearwater, 33765. Need not be present, all applicants will be notified via email as to the results. For grades, 1st-8th, applications are being accepted through December 31, 2013 and will be subject to a lottery process as described above. Plato Academy St Petersburg: Open enrollment for kindergarten 2014-2015 will be now through October 31, 2013. Lottery will be held November 6, 2013, 2:30pm at the Superior Management offices located at 2560 Gulf to Bay Blvd, Clearwater, 33765. Need not be present, email nofitications will be sent to all applicants. For gardes 1st-3rd, applications are being accepted through December 31, 2013 and will be subject to a lottery process as described above. For any questions, please contact Rina Psomas, Director of Admissions, at School@PlatoAcademy.net. PRE-K – VPK NOTE: The application below is ONLY for grades Kindergarten through 8th grade. For Pre-K or VPK inquiries please email the Pre-K team listed below at the respective school. 2009-2010 School Year FCAT Scores. 2010-2011 School Year FCAT Scores. Plato Academy Schools averaged 24 points higher than the county average in Reading! in the county in Reading! Plato Academy Largo's 3rd Graders scored third in the county in Reading! Plato Academy Schools averaged 17 points higher than the county average in Math! Plato Academy Clearwater's 8th Graders scored a perfect 100%, first in the county on the Algebra EOC Exam! in the county in Math! Plato Academy Largo's 6th Graders scored first in the county in Math! Plato Academy Schools averaged 25 points higher than the county average in Science! in the county in Science! Plato Academy Schools averaged 13 points higher than the county average in Writing! Plato Academy Largo's 4th Graders scored third in the county in Writing! "Results for Plato Academy were exemplary. The nearly uniform strength of Plato students’ achievement at the elementary level provides a challenge for Plato to identify particular areas that can improve in the coming year." Below are links to the uniforms page, and lunch page applicable to all Plato Academy schools. - Click to access an array of Plato Academy uniform options. Lunch - Click to see what's on the menu.